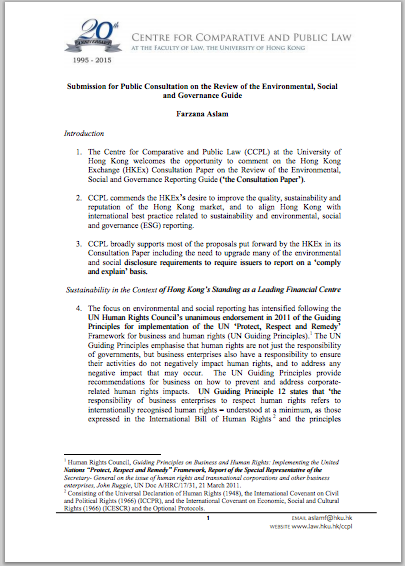 "Submission for Public Consultation on the Review of the Environmental, Social and Governance Guide"
Introduction: The Centre for Comparative and Public Law (CCPL) at the University of Hong Kong welcomes the opportunity to comment on the Hong Kong Exchange (HKEx) Consultation Paper on the Review of the Environmental, Social and Governance Reporting Guide (‘the Consultation Paper’). CCPL commends the HKEx’s desire to improve the quality, sustainability and reputation of the Hong Kong market, and to align Hong Kong with international best practice related to sustainability and environmental, social and governance (ESG) reporting. CCPL broadly supports most of the proposals put forward by the HKEx in its Consultation Paper including the need to upgrade many of the environmental and social disclosure requirements to require issuers to report on a ‘comply and explain’ basis... Click here to download the full submission.